Welcome to the Kazakhstan National Data Center (KNDC) site operating within the International Monitoring System (IMS) for verification of compliance with the Comprehensive Nuclear-Test-Ban treaty (CTBT) (http://www.ctbto.org). 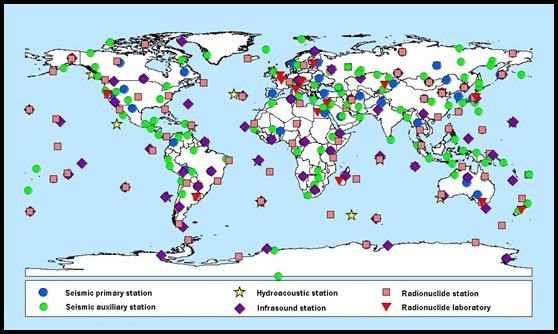 The International Monitoring System includes seismic, infrasound, radionuclide and hydro-acoustic stations located on the territory of 90 countries around the world. Its objective is control of the CTBT implementation. At the same time, high-sensitive stations operating round-the-clock record large amount of earthquakes and other natural and industrial events around the world contributing to solving the tasks of seismic safety, tsunami warning etc. The figure shows location of stations installed under the International Monitoring System of the CTBTO around the world. KNDC operates on the base of the Institute of Geophysical Researches of the National Nuclear Center of RK. Kazakhstan monitoring stations network consists of seismic and infrasound stations of the NNC RK; data from these stations are acquired and processed in KNDC (Almaty). These stations, on the one hand, participate in the International Monitoring System operation, and on the other hand, monitor seismic situation on the territory of Kazakhstan and Central Asia countries. Scientific researches in the field of seismology, seismic acoustic, geodynamics etc. German Research Centre for Geosciences ( GFZ, Potsdam, Germany) etc. Head of KNDC – Doctor of Physical and Mathematical Sciences, MIKHAILOVA Natalya.